Raaga.com: When Lata Mangeshkar had mistaken Kishore Kumar as roadside ruffian! When Lata Mangeshkar had mistaken Kishore Kumar as roadside ruffian! Meree aawaaj hee pahachaan hai, gar yaad rahe….. Apt words to define Melody Queen and Bharat Ratna awardee Lata Mangeshkar because even though coming generation may forget the legendary singer Lata Mangeshkar’s name and her identity but one thing that will live eternal is her melodious voice. It will continue to inspire and enchant music lovers for generations to come. 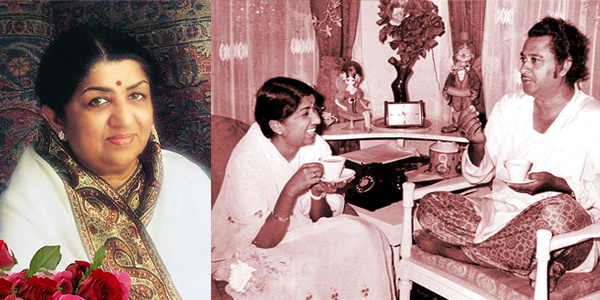 September 28 marks the 86 birthday of Lata Mangeshkar, popularly known as the Nightingale of India. The first meeting of Lata Mangeshkar and Kishore Kumar is an interesting tale. Kishore Kumar in an interview informed that when he was travelling in a local train in the mid 40’s he saw a young and simple girl sitting near window seat. When she looked at him, Kishore Kumar gave her warm smile but the girl gave a stern look. Kishore Kumar got nervous. When Dadar station came, Kishore Kumar got down. Incidentally the girl also got down at Dadar station. Outside the station the girl hired a horse cart and moved to her destination. Kishore Kumar too hired another horse cart and coincidently moved in the same direction, literally following her horse cart. Kishore Kumar was left astounded but before he could reply the girl hurriedly moved into the studio and complaint music director Khemchand Prakash about a roadside ruffian chasing her. Khemchand Prakash smiled and clarified her misconception and introduced Kishore Kumar to her! They had a big laugh and later gave many hits together.